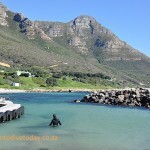 Saturday: No diving planned – why not join the coastal cleanup at Hout Bay harbour? 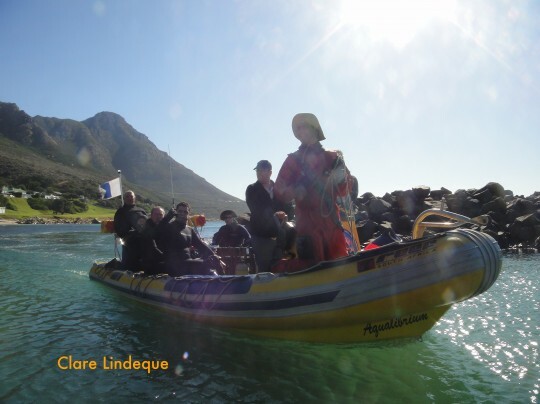 Last weekend we took the boat down to Buffels Bay in the Cape Point Nature Reserve to join OMSAC for a day of snorkeling, diving and braai-ing.. The conditions were terrific and both the shore divers and those on the boat had great viz. We took the boat to Batsata Maze and to an unnamed site just on the outside of the exclusion zone around the reserve. We were very fortunate to have a whale cruising by during the safety stop, fascinated by the divers’ SMB, and then hanging around as the divers surfaced. It is a stunning setting for a day out and even the tidal pool was filled with interesting creatures. 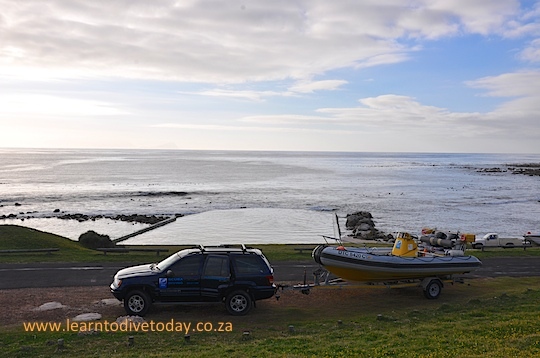 On Monday we enjoyed fantastic visibility at Partridge Point, where we snorkeled with seals, and at Shark Alley. There are still a lot of cowsharks around – the time of year when they usually disappear is approaching, so we are watching with interest. 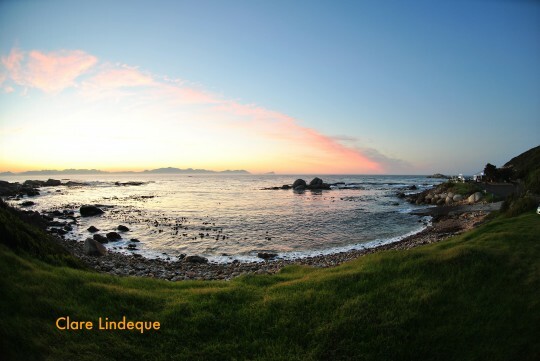 A southerly swell rolls into False Bay in time for the weekend. The Kalk Bay Shootout surf competition participants are all excited. When surfers are excited, divers are not. We share the ocean… Just not always at the same time. There is also the False Bay Yacht Club spring regatta taking place on Saturday and Sunday – more info here. 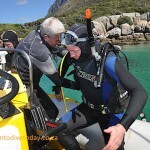 I doubt there will be anywhere pleasant to dive in False Bay. 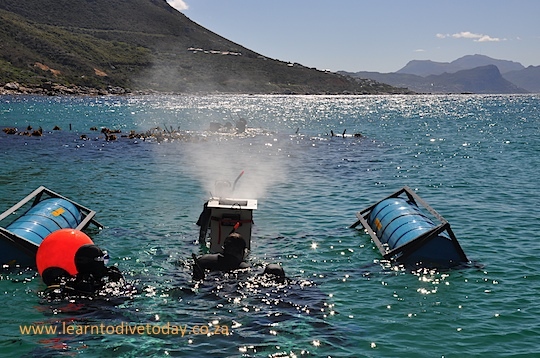 The south easter only starts blowing on Saturday so I doubt that the viz out of Hout Bay will improve enough for good diving. That leaves the Atlantic seaboard. Twenty four hours of strong south easter might clean the water close inshore enough for good diving. I reckon the best options will be North and South Paw or Justin’s Caves and surroundings, so that’s the plan for Sunday. If the south easter makes it over the top of Table Mountain, and cleans the water sufficiently, we will launching from OPBC at 10.30 am and 1.00 pm. If you’re keen to dive let me know and I’ll contact you on Saturday afternoon to let you know if conditions are good enough. 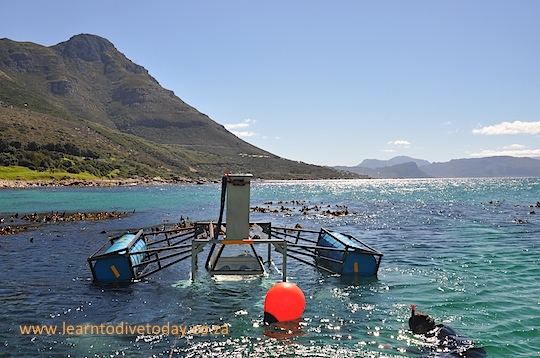 If you are at a loose end on Saturday, an excellent way to spend your time is at the coastal cleanup dive in Hout Bay harbour. We attended a few years ago, and it is great fun and good for the environment. Just wear a kilogram or two extra of weight if your weighting is usually marginal – the water is not very deep! In three weeks’ time the CTICC comes alive with the Cape Town International Boat Show. This year there will be a new addition in the form of a “dive village”. 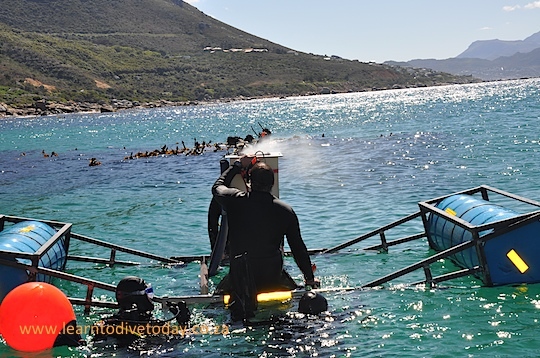 Collectively a bunch of local dive centres and operators have come together to make this happen with the goal of showcasing the incredible diversity of diving we have to offer in Cape Town. The village will have a pool in the centre and we will offer non-divers an opportunity to breathe underwater and hopefully come to enjoy the ocean as much as we all do. The show is on from 10-12 October at the Convention Centre. Come down and visit the representatives of your local dive operator and bring a friend who needs convincing that diving is the best thing ever, and amongst everyone in the dive village we will do our best to get them in the water. 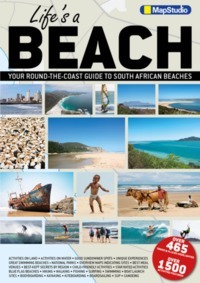 SURG will also be there showcasing some of the best photos taken in and around Cape Town’s waters. There are also bound to be a bunch of interesting course options, gear sales, camera displays and the like. Plus the rest of the boat show, which is well worth a look! 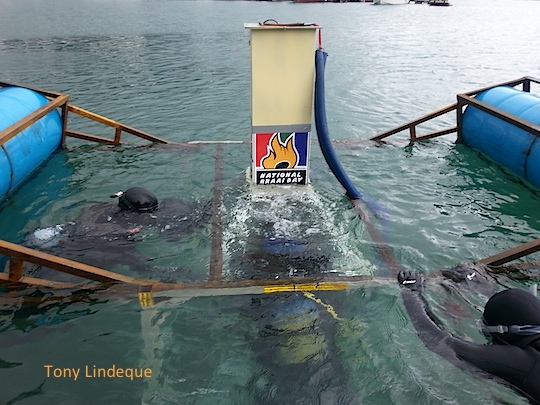 Yesterday I told you about the test run of Jan Braai’s underwater fireplace. Some repairs were necessary after that day, as the glass had cracked during the test run. 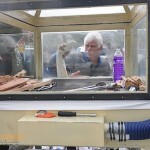 The designer added a few improvements and upped the suggested amount of ballast for the final attempt. 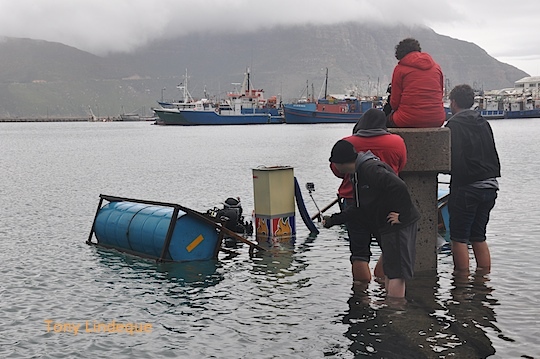 Weather days just were not playing along so we ended up in the harbour at the Hout Bay slipway on a very grey day. 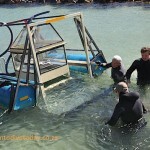 I had Seahorse for boat support, and Craig and Mark were there to assist in-water. The water looked good. The viz was not amazing, but certainly a good few metres for decent underwater footage. With a cameraman from Atlantic Edge Films, a cameraman from Jan Braai and GoPro and a further three or four GoPro cameras, we were ready to hit the water. 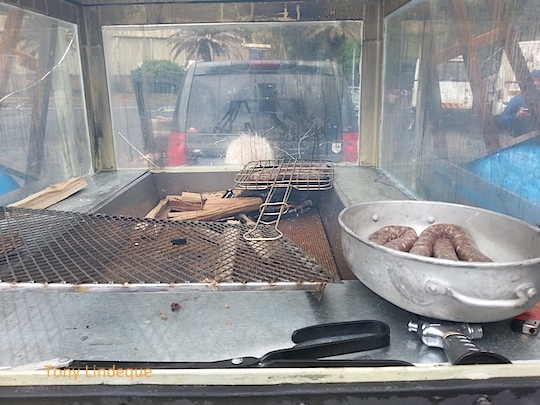 Jan packed the unit with wood, firelighters, a grill a lighter and some wors (for foreign readers: boerewors, wors for short, is a type of South African sausage that is typically cooked over a fire) and then shut the rear panel. 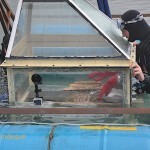 This panel had glove holes with gloves attached inside, like a chemistry experiment or hazardous materials unit, so the activity in the box underwater could be managed from outside. 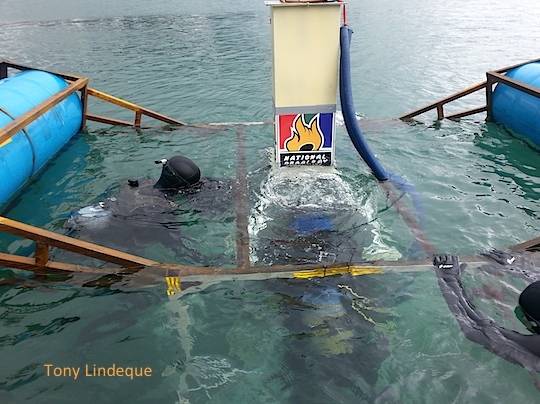 We wheeled the underwater braai into the water and swam it out to the buoy and anchors we had placed at the right depth beforehand. Sadly the required ballast had once again been miscalculated, and the centre would not sink to the correct depth. Back to the slipway we went, and the team added rocks and a few hundred kilograms of sand in plastic bags. 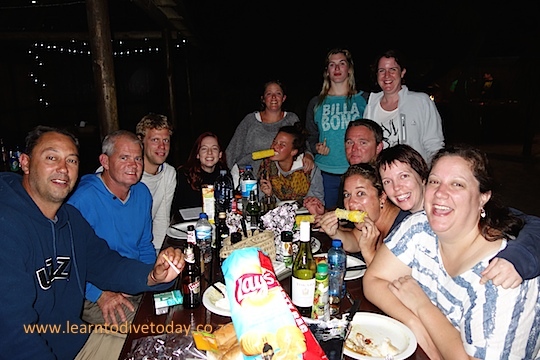 We swam the braai back out to the required depth and this time it was a success. Once the unit was submerged Jan, on scuba, with two safety divers in attendance, inserted his hands into the gloved openings, took the lighter, lit the firelighters and got the wood burning. The stack had an extractor fan to draw the smoke out and pipes to draw fresh air in, and once the flames took hold of the very dry well prepared wood the smoke was visible above the water. Jan then surfaced and waited a while for the wood the burn to coals. 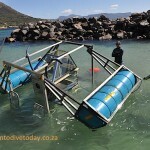 He then descended again and started the world’s first ever underwater braai. It took around 20 minutes before he surfaced, claiming the wors was ready for consumption. The unit was winched up to above the water line, Jan then removed the rear cover and proceeded to eat the first piece of meat cooked underwater. 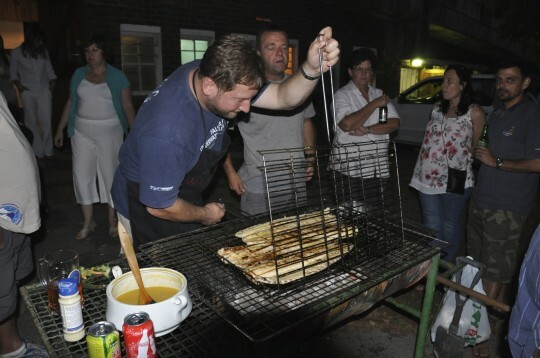 All in all the idea masterminded and executed by Jan Braai was a resounding success and was done to celebrate National Braai Day on the 24th September. The program showing the execution of the idea was broadcast on Kyknet on Friday 27 September 2013. There’s been a bit of press coverage – no one has done this before, as far as we know – and there are a couple of videos on youtube documenting the event. Check out a round-up of media coverage here, if you missed it. The project started a while ago when Jan Braai, a South African “celebrity” (what do you call someone with their own television show, two cookbooks and a dedicated facebook and twitter following?) decided that for Heritage Day/National Braai Day, 24 September 2013, he would braai at the highest point of the country and at the lowest point. The lowest point is technically at sea level and we have 3000 kilometres of coastline, so he decided to do it at 3 metres below sea level and this how the plan was born. A marine engineer in Pretoria drew up a proposal based on what he understood Jan wanted, some back and forth changes were made, and the build began. 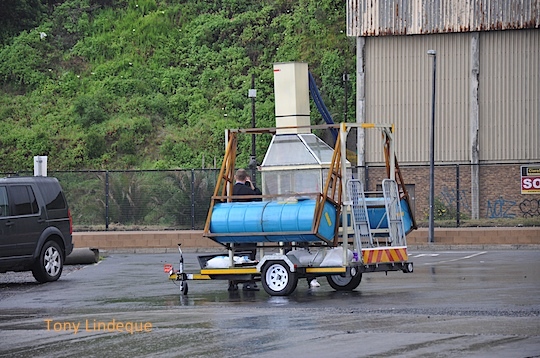 Once ready for testing the underwater braai unit it had to be transported from Pretoria and to ensure it did not fall off the trailer, it was welded on. We arrived at Miller’s Point on a calm sunny day with a slight south easterly wind and (sadly) a low tide. The unit was to be towed out to a depth of 3 metres and slowly lowered until the entire glass section was below the surface and only the stack was above the water. 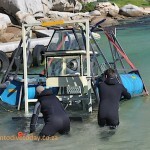 Buoyancy was handled by four 200 litre drums welded shut. The drums, two on either side, were welded to a pair of hinged arms and connected to the main frame by a winch cable. When contracted the drums kept the entire unit on the surface and to lower the braai the arms were winched outward and up and the box descended. Has Miller’s Point ever seen anything like this? Due to the trailer being part of the ballast and thus hanging well below the surface, the entire unit had a fairly large draft and getting it out of the basin at Miller’s Point was quite a challenge. We walked, pushed, swam and towed it with the boat and finally got it out to the depth we required. Craig and Christo worked incredibly hard to assist with this process. We then began lowering it and discovered we did not have enough ballast to get the braai compartment to sink. Regardless, the decision was made to test the capabilities of the braai and Jan lit a fire in the unit. It was at this point semi-submerged, not quite at the required 3 meters’ depth, but in at least two metres’ of water so all the glass was below the surface. Smoke comes out of the chimney! I’ll tell you about the final run tomorrow, but if you can’t wait and want to skip to the end result, you can see some video footage here. An underwater braai? Yes please! There is a press article about the event here (in Afrikaans) and here, in English. It was a completely harebrained yet brilliant scheme that succeeded against all odds. I had a fantastic time at the trial run at Miller’s Point and the actual event in Hout Bay, and received outstanding assistance from Craig, Christo and Mark. 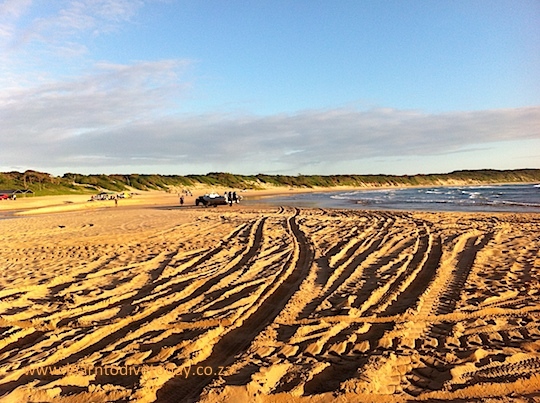 Posted on 28 September 2013 4 April 2014 Author TonyCategories Boating, Harbours, Photography, Skippering, SlipwaysTags braai, holidaysLeave a comment on An underwater braai? Yes please! To say it was a busy week is an understatement. 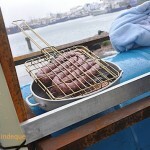 It started out with a test run of the worlds first underwater braai device at Miller’s Point, conceived and executed (with the help of a marine engineer) by Jan Braai. The tide was against us but we finally got the unit out to deep enough water and lowered it below the surface. There were a few teething problems that needed to be dealt with before the final attempt on Tuesday. Meanwhile, back to regular diving and on Saturday we launched for a group of Russians who wanted to dive with the cowsharks. Besides the fact they are currently missing, the weather wasn’t the greatest so we decided on Photographer’s Reef and the Clan Stuart. Their disappointment at being told there were no cowsharks was soon eclipsed but the appearance of a great white shark, over three metres long, within minutes of the backward roll at the Clan Stuart. The shark did a few passes and then allowed them to gather their wits and swim for shore. Well done to Craig and Christo for excellent leadership. There’s a short video taken by one of the Russian divers here. Starting on Saturday we will feature some more information about this event on our blog, so if you’re ever in a similar situation you can hopefully refer back to how others have handled it. If you’re impatient you can read the Scenic South article here. The divers all felt very fortunate to have had this experience, even if it made their hearts beat a bit faster for a while! The other dives for the day, Photographer’s Reef and Roman Rock, were not as exciting but the viz was good. 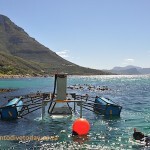 Back to the braai project we went, and on Tuesday we launched from Hout Bay, set anchors, buoys and a host of other gadgets including safety divers in preparation for the underwater braai. 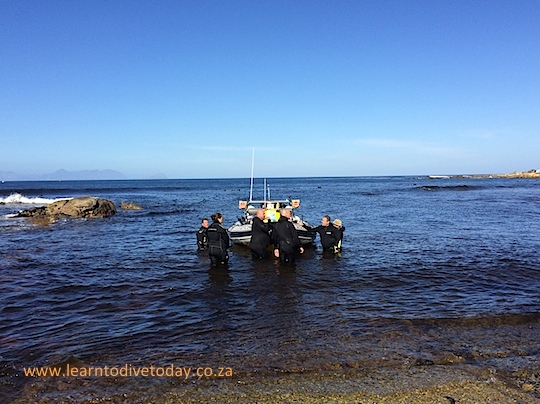 In calm and cool conditions we finally sank the unit to the required depth and the man Jan Braai, on scuba, lit the fire, waited for the wood to turn to charcoal, and cooked some boerewors. Once done we raised the unit, he removed the rear panel and ate a well prepared piece of meat. The show featuring this harebrained scheme will be broadcast on Kyknet on Friday 27 September. There’s some press coverage here and here, and a short video in Afrikaans here and an English one here. 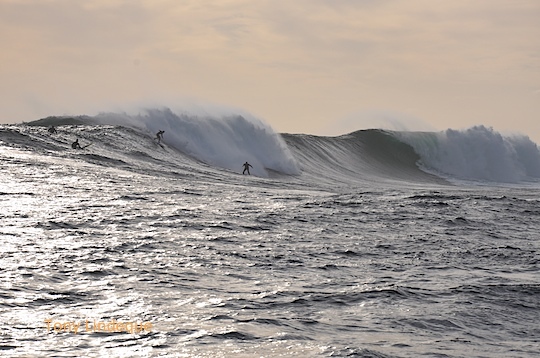 Yesterday we launched from Hout Bay again, this time for a bit of big wave action at Dungeons. A couple of big lenses and a few surfers with even bigger bravado and huge skills entertained us to almost four hours of some of the best surfing I have ever watched. The swell was huge, the sound alone is mind blowing and the speed at which they come down the face of this wall of water is astonishing. If you have not been to watch it is definitely something to add to your bucket list. There are some photos on facebook, here. 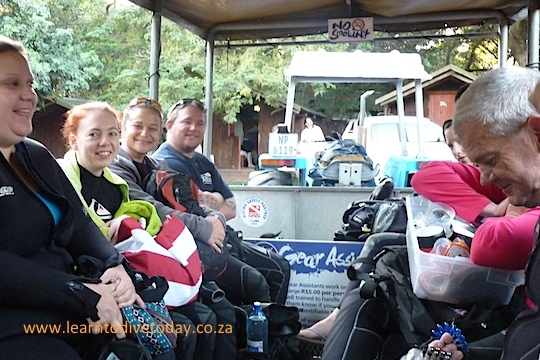 We are busy with SDI and PADI Open Water and Advanced courses, Craig is about to step into the world of Divemasters, and summer is on its way. Well, Saturday is World Oceans Day and an underwater cleanup event will happen in the yacht basin at False Bay Yacht Club in Simon’s Town. If you have always wondered what it looks like under the yachts moored there, sign up here. I had planned to launch after the cleanup but sadly I doubt the conditions will be all that good, so I’ll do pool work in the afternoon. Sunday on the other hand does look good and we will launch, from the False Bay Yacht Club. I have a navigation dive with a few students so we will do this at Pyramid Rock and see if the cowsharks are back yet. On Monday we will most likely do shore dives at either A-Frame or Long Beach (they’ve had several whale sightings at boring old Long Beach lately!) and will launch again on Tuesday. 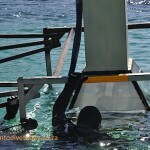 I think Tuesday’s swell and wind will make for a great opportunity to dive Batsata Maze and Atlantis. If you want to dive, let me know by text message or email! The inaugural OMSAC Treasure Hunt was held on 9 July at the Cape Boat and Ski Boat Club at Miller’s Point – their very exposed slipway faces the opposite direction to the one we usually use, but (a major point in its favour) the CBSBC has facilities that are otherwise lacking at Miller’s Point… such as toilets and a shower or two! 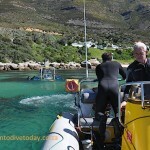 The bar was also appreciated by some chilly divers after their dives! 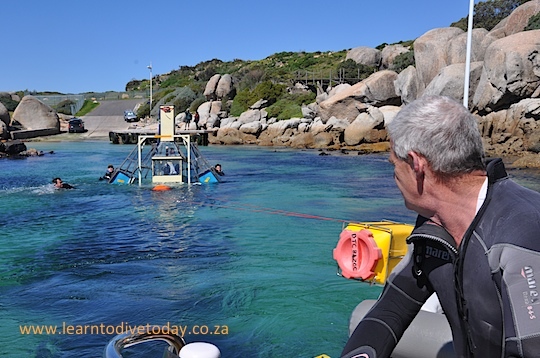 OMSAC had done a sterling job of marshalling the support of three local dive charters: Dive Action, Underwater Explorers and Pisces Divers. 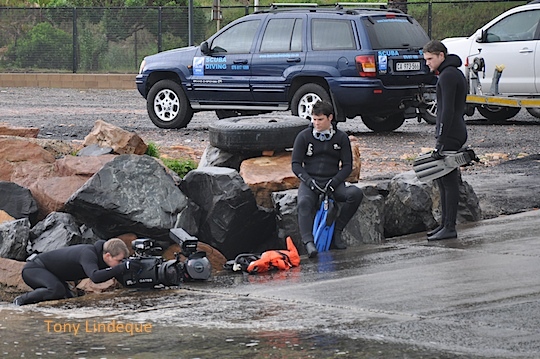 Their boats were launching hourly to nearby dive sites, and a couple of Extreme Shore Dives were also on the program. I’m not entirely sure what was extreme about them (I think the prizes may have been – they got gold golf balls)… Perhaps a reference to the looooong surface swim from the slipway to Shark Alley! In the week prior to the OMSAC Treasure Hunt, Tony and I watched the wind with much trepidation. An unseasonal southeasterly was buffeting the bay, which usually leads to poor visibility and unhappy divers. 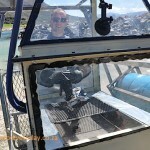 We were surprised and delighted, however, to have 10 metre visibility on the SAS Pietermaritzburg (most unusual!) and 4-5 metres in Shark Alley. The surface conditions there were unpleasant, since by the time we launched for the second time – around 1330 – the swell had picked up quite considerably. The weather on the day was magnificent – anyone who was in Cape Town on that weekend will recall it as being an absolute shining gem in the middle of winter that heralded the start of several beautiful, sunny weeks. The sun shone all day, and I spent some very happy hours sitting overlooking the waves at Miller’s Point, watching whales frolicking in the bay, and chatting to Errand Girl Bernita. There was also a steady stream of familiar faces passing by our spot in the car park, so we were not short of entertainment between dives. In addition to the diving there was a festive atmosphere with boerewors rolls on the braai (included in the registration fee was a voucher for a boerie roll and an iced tea – owing to a glitch the iced tea never materialised but there were drinks available for purchase at the venue), a small market, and stands manned by DAN South Africa and Manex Marine. I heartily approved of the sale of coffee and hot chocolate in enamel mugs for R10, and R6 for a refill (you got to keep the mug). 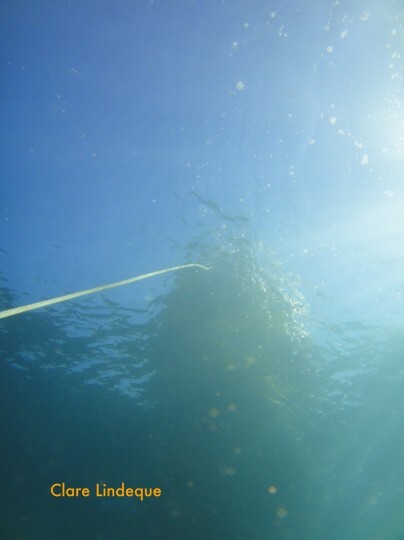 The Treasure Hunt aspect of the day passed me by – I actually forgot about it as soon as I rolled into the water – but on each dive the skipper had four marked golf balls which were tossed overboard after the divers had backward rolled off the boat. Each golf ball corresponded to a prize, some of which were rather nice. This part of the day could do with some work for next year’s event… On most of the dives, one person found all the balls, as they fell close together, and one lucky chap collected about ten golf balls in total. He was also rewarded with a (ridiculous but very nice) prize for finding the most golf balls – share the love, people! There was a raffle with the prize of a VERY proper diving holiday to Mozambique – somehow I also missed this, which is lucky as I would have spent the cost of the holiday on tickets to try and win it! In our goodie bags for the day we received back copies of Submerge, Africa Geographic and Birds & Birding Africa, as well as a fetching Old Mutual t-shirt. We were also (including the 15 year old girl who was diving with Tony’s group) each given a bottle of Sedgwick’s Old Brown Sherry. The juxtaposition of drinking and diving was slightly inappropriate! Imagine my delight to win a second bottle in the lucky draw. If anyone can suggest what two teetotallers can do with 1.5 litres of sherry, please let me know… Current best idea is to use it as drain cleaner! Diving events like this that aren’t all about pushing a particular brand of gear are a big boost to local diving, and we really enjoyed the day with OMSAC. It was smoothly run, well organised, and there were provisions made so that even if the weather had been horrible, we could have a hot cup of coffee and a shower after our dives. 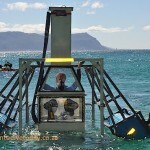 In winter in the Cape – when the diving is the best in False Bay – this is important. 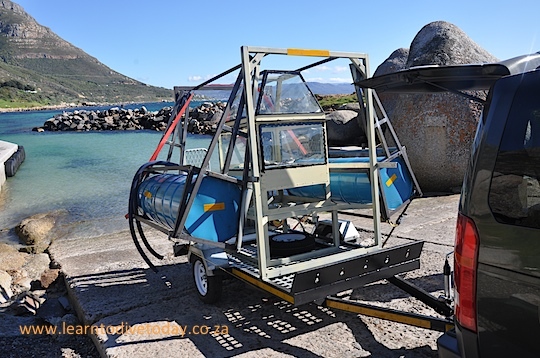 It’s no mean feat to put together something like this, and as the OMSAC committee has already demonstrated with the Robben Island Coastal Cleanup we attended last year, they are more than up to the task! We’re extremely grateful for their efforts and look forward to future events. Many of Tony’s students come to him with extensive skin diving experience. Living in Cape Town, it’s almost obligatory to enjoy at least one lobster braai during the season (and often many more). Sometimes the veteran lobster-divers struggle at first with breathing through a regulator – their instinct while under water is to hold their breath (it’s illegal to take lobster when you’re on scuba). But their comfort in the water (and being used to the cold) stands them in good stead, once Tony’s tapped them on the regulator a few times to remind them to inhale! 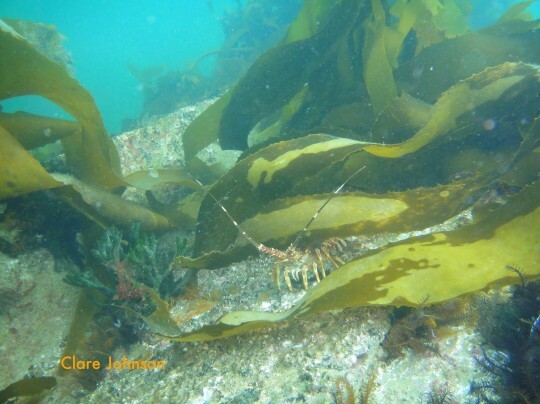 We see West Coast rock lobster (not crayfish – those are freshwater creatures) in both False Bay and on the Atlantic side. They are gregarious, and can often be found sheltering in cracks and under overhangs, in quite large groups. It’s a pleasure to do a deep wreck dive such as on the Maori and on the BOS 400, and see hordes of good-sized rock lobster teeming all over the wreck. 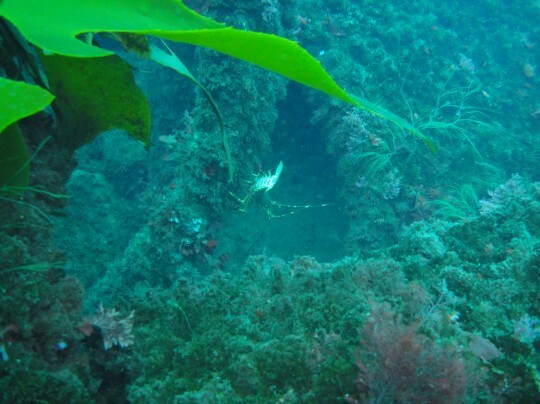 Some of the shallower sites are definitely over-fished, and we only see really big specimens when we dive beyond the range of your average skin diving lobster hunter. On Gerard’s first deep wreck dive in Smitswinkel Bay, we hadn’t been on the wreck for three minutes when I turned around to see him excitedly waving a MASSIVE lobster at me, the biggest either of us had ever seen. Some finger waggling and head shaking convinced him to replace Mr Lobster in his home, but I think Gerard was heartbroken. Rock lobster are almost impossible to farm. At the Two Oceans Aquarium on our crash course in marine biology we learned that there are 13 larval stages, during which time the creature drifts hundreds of kilometres offshore through a huge variety of water conditions that it would be impossible to replicate in a mariculture setting. The larval phases can last up to two years. 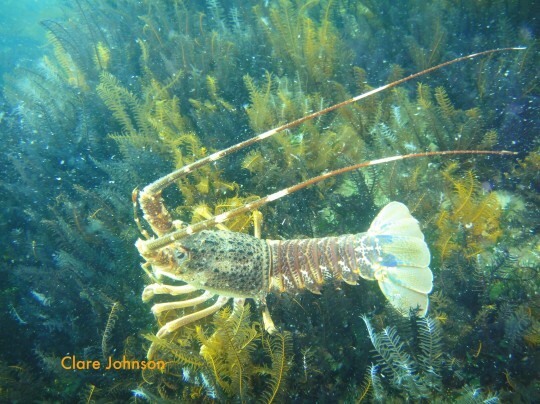 Lobsters grow very, very slowly and can live to the age of 50. There’s some nice detail on the Two Oceans Aquarium website. They eat crabs, abalone, starfish, snails and sea urchins – this latter fact makes them quite important in the ecosystem as a whole. I’ve mentioned before that juvenile abalone shelter among sea urchins. 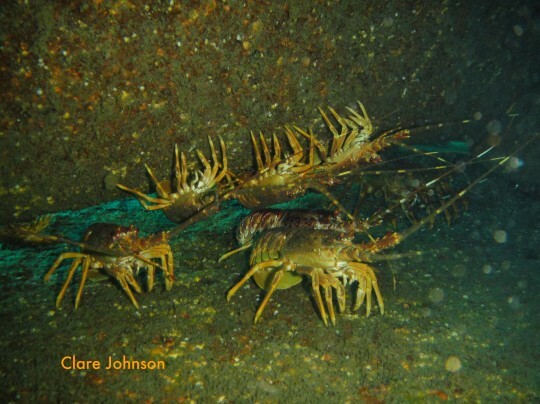 If there are too many lobsters, they eat too many urchins (and too many abalone) and this leads to a decline in the population of abalone. It’s a fine balance. 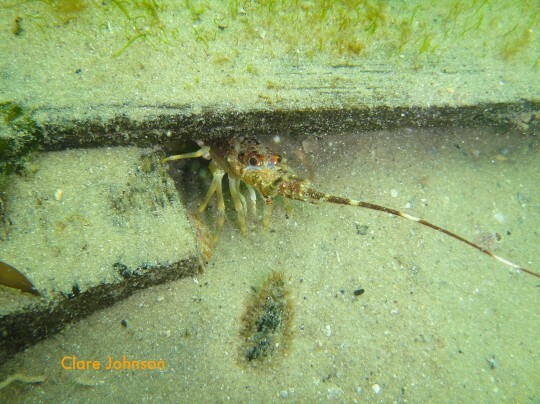 Lobsters are incredibly sensitive to the level of oxygen in the water, which sometimes leads to what look like mass walkouts onto the beach when there’s a red tide or similar event leading to (near-)anoxic conditions on our coastline. What actually happens is that they move away from the de-oxygenated water where the red tide has died, and get stranded on the beach by a retreating tide. Once when Tony was landing a dive boat at Miller’s Point, he was waiting for a chance to use the slipway next to a fishing boat that was packed to the gills with lobster. The captain said they’d found a spot where thousands of lobster were strolling together in orderly formation across the ocean floor, and he’d just scooped them up. (He would not share where this magical location was, but the lobster were probably moving to more highly oxygenated waters.) Having substantially exceeded his quota, the fisherman was somewhat twitchy about being pulled over by the authorities! 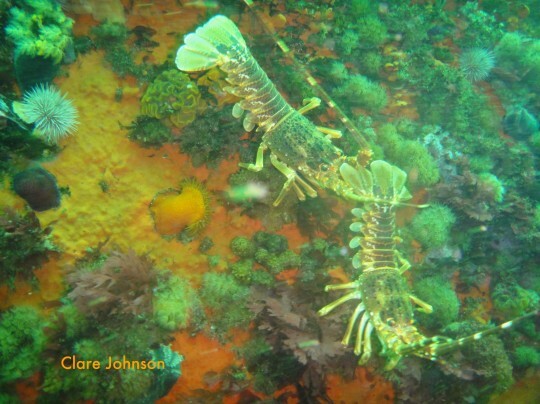 Poaching of rock lobster is a big problem in South Africa. 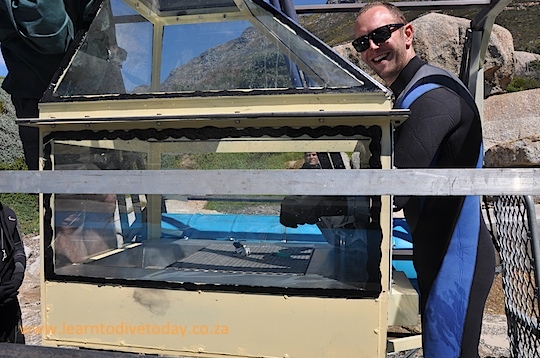 They’re a very valuable commodity – you just need to go and have a seafood platter at a Camps Bay restaurant to see what damage it can do to your wallet – and easily accessible to anyone who can hold their breath and is prepared to do a bit of rock scrambling. 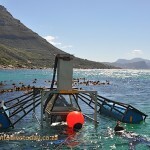 The government Department of Environmental Affairs tries to manage stocks by implementing a closed season, catch and size limits. There are also regulations about the number of rock lobster you may transport at once, or have in your possession. If you’re in doubt as to the utility of this array of regulations, check out the graph in the middle of this page on the Department of Environmental Affairs website. Depressing. 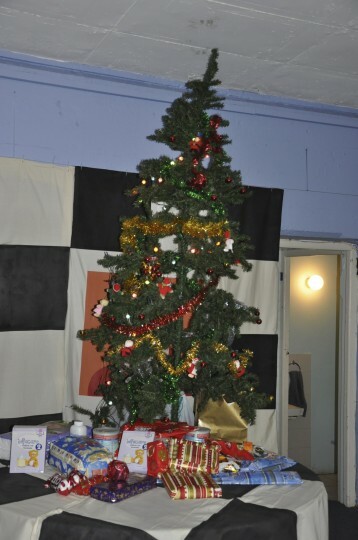 Tony and I recently attended the annual Christmas party of False Bay Underwater Club (FBUC), of which we are members. Tony was a member of the Durban Undersea Club while he stayed up north, but it’s my first experience of belonging to any sort of club (except, of course, for the Cape Town Girls Club, of which I was a founder member at the age of ten) – let alone a diving club. There are numerous benefits – among them, cheap gear hire, free air fills on club days (Wednesday evenings), and access to courses at reduced rates. FBUC offers CMAS courses to its members and other interested parties, and Tony, Kate and I recently completed a compressor operator course there. 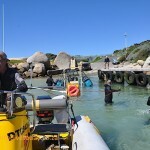 The club periodically performs ocean cleanups (Simon’s Town yacht basin was their last one), and is involved in several social responsibility projects – for example, the gifts and baby supplies that we brought to the Christmas party are to be donated to the Beautiful Gate in Crossroads, which cares for babies, children and families in the community, many affected by HIV/AIDS. FBUC also holds weekly club dives – there’s a mailing list that informs members where to meet, what day (usually Sunday), and what time. Tony and I have not had a chance to explore any of the Oudekraal shore entry sites yet, and that’s been on hold while we sort out a wetsuit for him that isn’t quite as highly ventilated as his current one, but we look forward to tagging along on some club dives to learn the shore entry dive sites we don’t know in Cape Town. We’ve learned a huge amount just chatting to other members over a drink (or a fish braai) on a Wednesday evening at the club. It’s been lovely to meet interesting, like-minded people who love the ocean and exploration and are happy to discuss it. 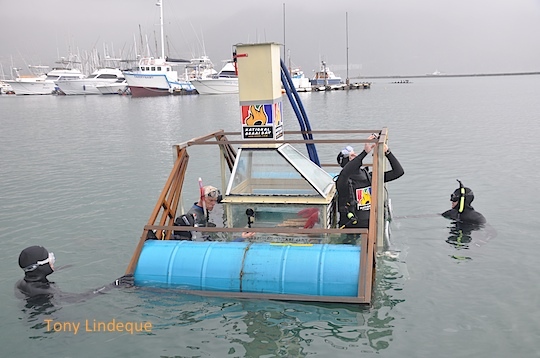 Everything I’ve described regarding False Bay Underwater Club also applies – one way or another – to the other main diving club in Cape Town, Old Mutual Sub Aqua Club (OMSAC). 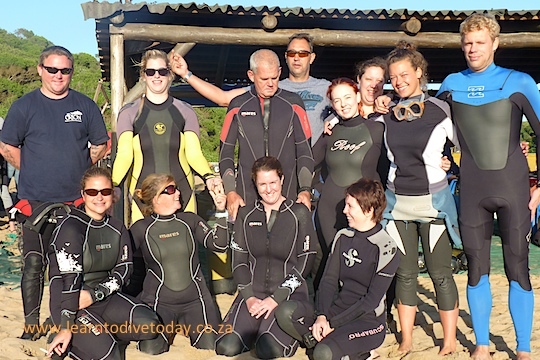 We accompanied some of their members on a cleanup dive on Robben Island earlier this year. It’s not particularly cheap to be a member of a dive club, but I think it’s been well worth it so far. Not so much for the gear hire and air fills – Tony has his own gear and requires air fills FAR more often than once a week – but for the other reasons I’ve mentioned.